We know what it is like when there are service support issues surrounding large mainframe CICS sites. Such problems cause anxiety and doubt and affect business critical systems adversely. Only CICS specialists are able to investigate and the tools available to them are inadequate. Most monitoring tools in use today, whilst excellent in their own ways, do not focus on the application. Instead they have an infrastructure wide view which may not provide the insight to quickly establish what you need to know. Many of these tools also fail to provide a CICSPlex-wide perspective of your applications infrastructure, making it difficult to visualise the entire footprint of your applications. Our flagship product, PlexSpy Application Status Monitor, aims to address these issues. It has been designed from the beginning to focus attention on the specific CICS infrastructure that a named application is dependent upon. It is capable of providing a CICSPlex-wide perspective and we are convinced that this will be invaluable to your support staff as they strive to provide the best service possible to your customers. This solution allows you to identify the status of your named CICS application with one click of a mouse button. Graham Clark, CICS Systems Programmer, TNT , UK. Why did you take the trouble to create another CICS monitoring product? There are several big players already and it is a mature market. From experience as systems programmers at the sharp end of support in large CICS sites, we have seen what happens when problems arise involving CICS applications. Invariably, CICS support staff are told the name of the application said to be having issues but they are often unable to identify exactly what it is they should be looking at to investigate the causes of the reported problems. The tools that they have are focussed on the wider CICS infrastructure and typically focus on a single resource type at a time in a single CICS region. This means that it can take some time for the problem to be understood and at no time is the complete CICS footprint of the application visualised. Modern high volume CICS applications typically use the resources of several CICS regions that may be executing on different z/OS LPAR’s on different mainframe hardware, possibly even in different locations or even time zones. Many different types of resources will support the application across these regions. Even if the support staff know which resources are used, they are unable to visualise those resources with the tools that they currently use. All of this means that it can take a considerable time for the support staff to fully understand the status of the application and to resolve the problems. PlexSpy was devised to provide a means of quickly monitoring all of the specific infrastructure underpinning named CICS applications. What versions of CICS does Plexspy work with? PlexSpy works with versions of CICS from version 3.1 onwards. Who can benefit from using PlexSpy? Anyone who works in a support capacity where CICS sits at the heart of the business. PlexSpy itself is a CICS application. It uses the CICS document interface to interact with users via a web browser and exploits the power of the CICSPlex SM API to obtain real-time status information about CICS infrastructure. Who are Matter of Fact Software? We are a young software development Company focussed on providing innovative software products in the CICS arena. 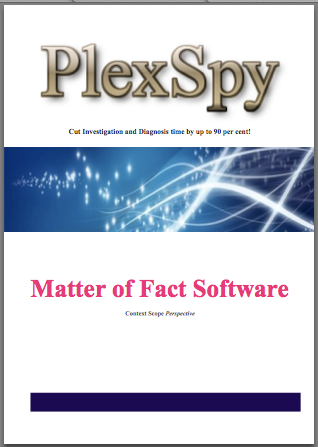 Matter of Fact Software was established to bring the PlexSpy product into existence and to market and aims to build from this base with other products in the future. Based in Scotland, we were established in 2008 and our Directors have many decades of commercial experience of supporting CICS infrastructures. What are the main benefits of PlexSpy? PlexSpy will allow your support staff to quickly establish the status of your named applications when reports of issues arise. In the past this has been problematic as it can take some time for support staff to understand what aspects of the infrastructure support a given named application. Using PlexSpy it is possible to pre-define the name of your business application and associate it with the specific infrastructure upon which it depends. Now when a call comes in suggesting that there is a problem with that named application, with the click of a mouse button, your support staff instantly know what aspects of the infrastructure to look at and have some useful status information about it. Does it take a lot of expertise to use PlexSpy? Defining your named applications to PlexSpy is the work of a specialist. However, once that has been done, even a layman can drive PlexSpy to obtain the valuable status information that it provides. As a result, first level support staff are less dependent upon the second level support specialists to answer technical questions about an applications status. Are there any special requirements to run PlexSpy? Nothing special. If your site uses z/OS 1.8 or later along with CICS 3.1 or later and has implemented CICSPlex SM, then you can use PlexSpy. Note though, that you must have TCPIP running on the LPAR on which PlexSpy executes. Click the image to download a product brochure.